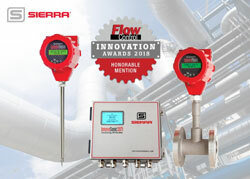 Monterey, California- Sierra is pleased to announce its Big-3™ One Complete Flow Energy Solution with three advanced technologies to cover all air, gas, water and steam applications has been voted one of the most innovative flow measurement breakthroughs by the readers of Flow Control Magazine of its 2018 Innovation Award. The Big-3 offers facilities engineers one flow energy solution which is ideal for managing and optimizing flow measurement for industrial facilities of all sizes. It features Sierra’s QuadraTherm 640i/780i thermal flow meters, their InnovaMass 240i/241i vortex flow meters, and their new InnovaSonic 207i ultrasonic flow meter. Designed, built, and calibrated in the USA by Sierra, the Big-3TM share the same revolutionary Raptor firmware and many of the same software apps. They are a complete flow energy solution for flows like compressed air, natural gas, steam, and hot and chilled water. Together, they set a new standard in ease-of-purchase, performance, accuracy, reliability, and ease of use. The Big-3 share common firmware and software for easy integration, set up, and serviceability, enabling operators to leverage their knowledge between the different platforms. All patented Big-3 (thermal, vortex, and ultrasonic) sensors provide unparalleled accuracy, extensive flow knowledge through multivariable functionality, and benefit from the Raptor operating system to manage sensor inputs. QuadraTherm iSeries thermal sensors offer a no-drift sensor with a lifetime warranty and accuracy of +/-0.5% of reading. QuadraTherm’s four sensor technology provides the critical inputs for Raptor's living, learning algorithm set and gas database to accurately manage changes in gas and pipe selection, gas temperature, gas pressure, and outside temperature. InnovaMass vortex sensors combined with the Raptor OS offer a patented Mass Balance sensor, improved DSP, and achieve flows below 1 fps. The InnovaMass iSeries measures up to five process variables with one process connection: volumetric flow rate, mass flow, density, pressure, and temperature, which is ideal for highly accurate steam flow measurement. The InnovaSonic 207i ultrasonic flow meter ensures accuracy of +/-0.5% of reading from 0.16 to 40 ft/s (0.05 to 12 m/s). This is maintained even if liquid density changes as the temperature of a flowing liquid moves up and down over time. Sensors are designed for temperature compensation to ensure correct speed of sound for increased accuracy and ease of installation. Raptor, the Big-3’s shared firmware system, is a fluid, dynamic algorithm set that has hyper-fast microprocessors, delivers digital communication protocols, provides field flexibility, and enables software apps. For QuadraTherm (thermal), Raptor calculates out unwanted heat transfer to provide precise mass flow rate. QuadraTherm also comes with on board qMix gas mixing software, which allows engineers to create custom gas mixtures in the field to compensate for gas compositional changes without recalibration costs and loss of accuracy. With InnovaMass (vortex), Raptor reduces external vibration with proprietary noise reduction algorithms to enhance the signal-to-noise ratio. Raptor firmware also gives InnovMass iSeries the ability to measure much lower flow velocities (near 0.5 fps) than equivalent vortex meters in the industry. In the InnovaSonic (ultrasonic) flow meter, Raptor, with its temperature input, adjusts fluid density calculation in real-time to maintain accuracy. Most ultrasonic metes assume a fixed temperature and thus lose accuracy. In addition, the Big-3 has shared software apps with common home screens. With the Big-3 there is no learning curve on three different software platforms. Big-3 software apps gives Plant Engineers and Managers the ability to mine and analyze data quickly to make effective productivity decisions. Software apps include ValidCal Diagnostics for field calibration validation, Datalogging, MeterTuning to automatically cancel external noise to improve accuracy, Dial-A-Pipe to change pipe size in the field, and Dial-A-Fluid to change fluid type in the field without loss of accuracy. The accuracy of the Big-3 is backed up with world-class calibration. Flow meters are only as good as their calibrations, and Sierra has invested millions in its state-of-the-art, fully automated, gas and liquid calibration facilities to assure consistent accuracy and repeatability of its flow meters. Sierra is ISO certified and follows ISO17025 guidelines. All Big-3 flow meters come with a NIST traceable and fully ISO 17025 compliant Cal cert. All three flow meters that make up the Big-3 are designed, built, and calibrated in the USA – A first for any USA company. Commissioning to set up the Big 3 is also available through Sierra’s global network of flow energy experts. A global leader in flow measurement and control for over 40 years, Sierra Instruments designs and manufactures fluid flow measurement and control solutions for customers spanning global industries as diverse as scientific research, oil & gas, energy management, semiconductor, clean energy, aerospace, and biotech, to name a few. In everything we do, we challenge the status quo to continually push our technologies and solutions to the next level to do the “never before possible” for customers. With over 150 locations in over 50 countries, Sierra is uniquely positioned to provide innovative products and lifetime support for the leading companies of today and the growth enterprises of tomorrow.